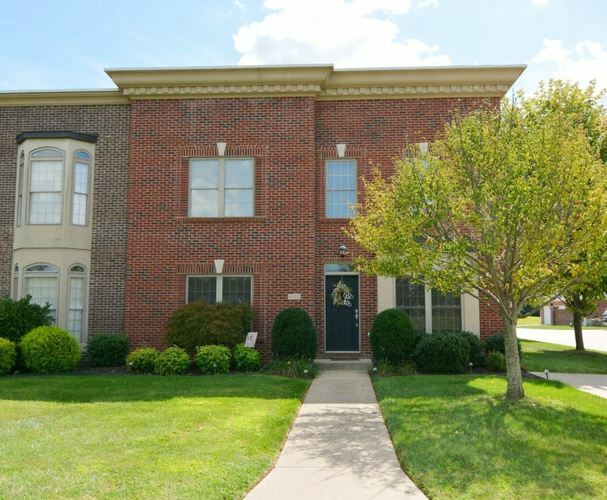 This lovely 3-bedroom with office/den, 2.5-bath Brownstone condo is located in Newburgh's Lexington Subdivision. Open floor plan and hand-scraped wood floors throughout will sweep you off your feet. The 2-story great room offers a beautifully detailed fireplace with a display area above and built-in cabinetry and shelves trimmed in wide crown molding. Kitchen is spacious with extended dinning area, an island, crown-topped cabinetry and granite counter tops with new back splash. The main-level master bedroom suite has beautiful crown molding and a gorgeous private full bath where you will find a double vanity, whirlpool tub, tiled walk-in shower, tile floor and walk-in closet. The upper level has a balcony style sitting area and 2 more bedrooms...perfect for family and guests along with a bonus room that would be great as a home office. This condo also offers a private patio and a 2-car rear load attached garage. This condo is an end unit. Sellers have recently replaced the master bathroom shower door, water softener and garage door including key pads and sensors. The home is wired for a security system and has had a brand new HVAC system installed. Average utilities are $225 for Vectren and $80 for water/sewer. Directions:From the expressway: East on Ferstel Rd, Right on Ashford (second entrance to sub) Left on St Clare, left on Glenview first condo on right.